Happy Sunday Everyone! I am the final stop on the Our Daily Bread Designs Anniversary Linky Party. I am so thrilled that Kelley allowed the customers to join in on the celebration. If you don't know about it the details are at the end of this post. Thanks for joining us! I hope you enjoyed my creation. Have a blessed day. Below are all the details & links for the Anniversary linky party in case you just dropped in to visit me today and didn't know about it. You'll want to join in on the hopping as there is a prize. March is an exciting month for Our Daily Bread Designs as it celebrates it's fifth year anniversary!! Kelley so appreciates the customers of Our Daily Bread Designs and is excited for the opportunity to celebrate with them today with the ODBD Anniversary Linky Party celebration!!! 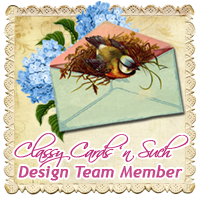 Below are the links of several fans and customers that have created cards or projects using stamps from Our Daily Bread Designs. To make the linky party even more fun, Kelley is offering one random participant/ hopper a $15 gift certificate toward stamps!!! The party will run from 2pm EDT March 10 until 2pm EDT March 11 Winners will be announced on the ODBD Blog March 12 at 7 am EDT There will be one prize including a $15.00 Gift Certificate toward stamps which must be claimed within two weeks!! Simply stop at each link on the link below , leave a comment and return to the ODBD Blog to tell us you completed the hop and let us know if you had any problems along the way! That's it! Enjoy! 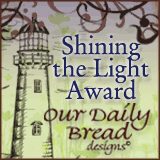 These links will also be posted on the Our Daily Bread Designs blog as well. This is lovely, Jennipher! That quote is one of my favorites and I love how you framed it and added the bird corner. Thanks for playing w/ ODBD in the Anniversary Celebration! What a beautiful card Jennipher!! I just love that quote and all the blue!! Your addition of the bird frame and the butterfly is such a gorgeous touch!! Thanks for joining us at ODBD for the Anniversary Celebration!! Oh how very pretty Jennipher! I love how you used the birds corner and the patchwork bg with this gorgeous die cut for one of my favorite quotes... It's sooo pretty!!! Thanks so much for helping us celebrate this special milestone for ODBD!!! So pretty! Love the 'denim' look of the blues on your card. How pretty! Wonderful color combination, love the way you framed the quote. Thanks for joining the ODBD Customer Linky Party! beautiful colors and beautiful spellbinder to showcase the quote! Hi Jennipher!!! We are so happy you are partying with us today!!! Your card is stunning! Love the blues and this Jim Croce lyric stamp is one of my all time favorite ODBD stamps!!! Beautiful card! Wow! You have it all in this card. Quilt, bird, color scheme and wonderful sentiment. A real winner! Gorgeous!! Love the butterfly and perfect way to frame that sentiment. So lovely. You used one of my favorite sentiment stamps. I love how you framed it. Beautiful card. Wow this is so pretty, beautiful colors! Beautiful card. love the choice of colors and papers. love the layering and the butterfly is cute. thanks for sharing. Love the pretty blue & cream colors! The die cut is so pretty and the butterfly tops it all off beautifully! I love the butterfly on your card! 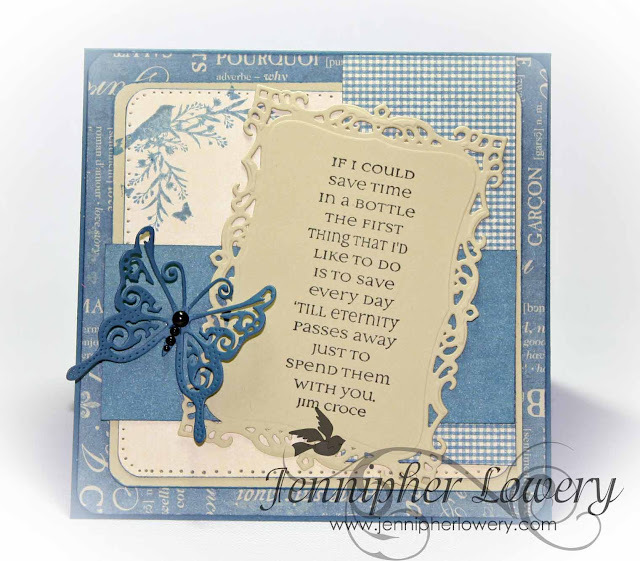 The use of the birds and butterflies set off the words from a beautiful song - and I love the blue tone on tone you used. Gorgeous! Oh my goodness Jennipher - this is gorgeous! I love the colors and patterns you mixed with that sweet bird image and the lovely butterfly! This is one of my favorite Jim Croce songs and I will now be singing it all day, which is fine with me :) Somehow I did not not know that ODBD had this in their collection - will definitely be adding this to my wish list! Thanks for sharing! I didn't realize those lyrics were on ODBD stamps, Love the way you used the bird corner stamp, great touch and such Lovely papers to top it all off, Lovely card! Very beautiful! Love the use of the corner stamp and the colors you've selected! That butterfly sure sets off the main image panel! Lovely work! Thanks for joining us at the ODBD Link Up Anniversary Party! Blessings! Absolutely charming!! Love the papers you used as a backdrop for that beautiful sentiment! Beautiful card - it feels so homey with with the quilted look. So creative. Love your beautiful blue card! The soft blue colors and patterns create such a lovely quilt-like effect. Love the sentiment! wonderful card and I love this song. So lovely. I couldn't read the sentiment. I had to sing along with it. 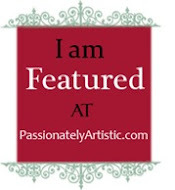 Thanks for the invitation to your blog hop. I really enjoyed seeing all the creations. gorgeous!!!! love everything about it!!! You framed that wonderful song so beautifully! Lovely job! Very nice. Love that poem. Beautiful colors! And your butterfly is so intricate. I realize you don't see many songs in stamp form. I like it! What a grand slam to end the blog hop- your card is amazing!!! So pretty! Love the design, senti and that butterfly, TFS! Very pretty. I like how you added the sentiment on an angle. thanks for joining our Anniversary Celebration! Such a beautiful card! It goes perfectly with the sentiment. 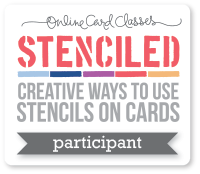 This is a wonderful way to use one main color and also have variety on the card. I love it. Can't wait to try something similar. Love your color scheme and designs, Jennipher! Thanks for sharing. Love the angle of your main panel and all that blue! Thanks for joining the ODBD linky party! love the blues!! great job with this card!! What a fabulous card! Just love the blue colors. This is beautiful, Jennipher!! I love the die cuts!! This is gorgeous Jennipher! Love that design paper.